My boys are used to me receiving various things in the mail for review, and are often interested in the products. A couple weeks ago, I received a box that held a new Nintendo DS game and they were very excited about being asked to review it! My boys love to play Nintendo DS. The games are kept in a game library (fancy way to say "paper cup in the kitchen cupboard") so I can keep track of what they're playing and how often they play. They were eager to add a new game to their collection. I thought it would be fun to interview them for this review. As a reminder, C is 7yo and N is 6yo. Tell me about the game. N: You adopt a pet with it. You play fun games, like at the carnival. Everything has to be done with your DS pen. C: You can choose how you want your pet to look -- he can even have polka dots or stripes. You earn money by playing games and you can also get food for your pet by playing games. The money is actually shells and you use it to buy toys and clothes for your pet. The clothes are from around the world, and from different centuries -- like pirates or kings and queens. You also have Wi-Fi airport where you can go around the world. C: The part when you throw needles at the balloons and also when you can make your own food with a recipe that it gives you. I also like the card game, Memory. You can unlock different parts by making friends. N: When you get to move your pet around and put him wherever you want to. You can put your pet in a boat! Would you recommend this game to others? What didn't you like about the game? C: We didn't like that only one pet could be created. We like games that we can share by setting up different profiles, but we need to buy a 2nd game for a 2nd pet. If you only have one kid, though, then it'd be fine. Any last things you'd like to share with the internet? C: When you play it, you don't even think you're at home! You feel like you're in the game. I hope this game gets on the best seller list. I knew it was going to be fun when I read that a mom created it, because moms know what is fun for kids. N: You can unlock Pirate's Island and it looks like a really cool place. It was SUPER fun to play! Thank you very much for your help, boys! C: Ok, can we go back to watching Tom & Jerry now? 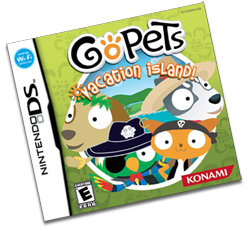 Read more about the GoPets Vacation Island at the official GoPets website. The game is rated "E" for Everyone, which is a requirement for games in our home. Thanks to MomCentral for sending the game for review! The boys have stated that they love helping review food items, but are definitely up for doing more game reviews!